I love this flickr feature! Using my cameraphone, I can send a picture message (MMS) directly to flickr. 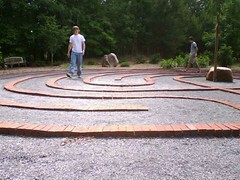 At right is one I uploaded during my class’ visit to a labyrinth in nearby Alpharetta. Can I send a photo to Flickr from my camera phone? Absolutely! You can upload photos to Flickr from your camera using your unique email upload address. Set it up here. When you upload photos via email, the subject line is used as the title of your photo, and the body of the email is used as the description. You can also upload your camera phone photos to an outside blog. First, set up the blog (see the Blogs FAQ section for help). Then register a unique email upload address to post to your blog. Photos emailed to that address will be blogged automatically. When you’re auto-blogging, the subject line of the email is used as the title, and the body is posted as the photo description. Does it cost extra? That depends on your text messaging plan. I don’t pay any extra but YMMV. I am an AT&T customer and have a texting plan. Capturing those great moments in the classroom to share with parents. I upload immediately (no forgetting!) and notify parents by email at the end of the day. Poor-man’s smart board. I’ve taken photos of my whiteboard for the students to reference later. The cameraphone is handy to use when a proper camera would be awkward to use — like in a store. Picture -> email is handy when you don’t have internet access, like when power went out for several hours at my school! This entry was posted in web2.0. Bookmark the permalink.